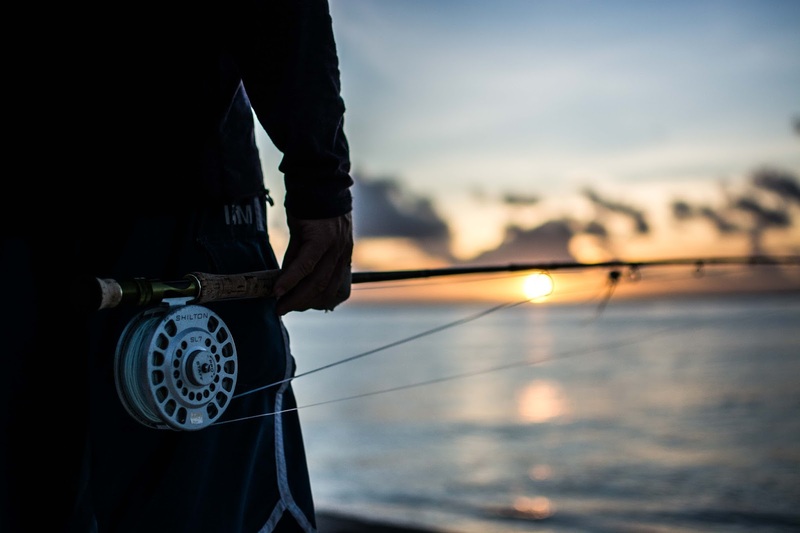 April Update from Alphonse Island Fishing Co.
As April rolled along towards the end of the fishing season, recent weather had caused a mixing of surface water layers and thus a reduction in water temperature, which the fish were very happy about. This led to some really great fish being caught and there were many stories of the ones that got away as well as the ones that didn't. The GT's made themselves known and the triggers were ever happy, two guests found gold and some incredible bonefish fishing was had by all. Richard Maree, brand new to the sport of fly fishing got stuck straight into a good 80cm GT on white sand on the first day. The fact that the real handle turns when the fish runs was a steep learning curve and this left Richard with a wrapped up hand and on the bench for a few days. Jim Klug, finished off his week with a good moustache triggerfish, a gorgeous yellow-margin and a solid 70cm GT. Jim's yellow-margin sealed the deal for his last day 'flats slam'. Tom Bie was not to be out done by his boat partner and on the last day managed to go tight with a 100cm GT, this was however not without incident. After the first hook set Tom decided to put all his effort into it and took one too many steps backwards and stepped right off the skiff. This didn't hamper his ability to stay in tune with the matter at hand and he managed to get his fish. Tom also finished up with another GT of 85 cm, two moustache triggerfish and a yellow-margin. Another man to join our 100cm GT club was Jake Ellington as he managed a brute 106cm fish whilst popping in the lagoon. Some days are just remarkable no matter which way you look at them. Andrew Schonbek and niece Stef Beer had one of these days. Each of them managed two moustache triggerfish, Andrew capped his 'Flats slam' off with a 75cm GT on the walk back from the surf, while Stef managed her GT of 100cm prospecting over some submerged coral. Two 'Flats Slams' on their own is amazing, but the day had already started with Stef landing her first indo-pacific permit. Andrew went on throughout the week to get a few more triggerfish and another GT. Larry Pierce had one thing on his mind this week and that was catching bonefish, which he proceeded to do with aplomb. Larry finished his week off with approximately 300 bonefish. When Larry stopped catching Bonefish he landed one of the biggest permit of the season and a good moustache triggerfish. Stephen Zoukis got a 'Trigger Slam' while George Coetzee got on the board with a gorgeous moustache triggerfish. Jaco Buitendag worked really hard to get his fish but for the first few days he got schooled by our triggers. He finally got his own back by landing four moustache triggerfish in one day, which is an incredible achievement. The guys also spent some time on the Bluewater boats looking to get a sailfish on fly. Charl Schwartzel and Richard Sterne both managed to complete a 'Bills and Bones Slam' on the same day. With an incredible penultimate week of the season complete, all we can do is hope that the last week goes even better and the fish continue to play along.